This is our very favourite product for coffee, tea, or hot chocolate. 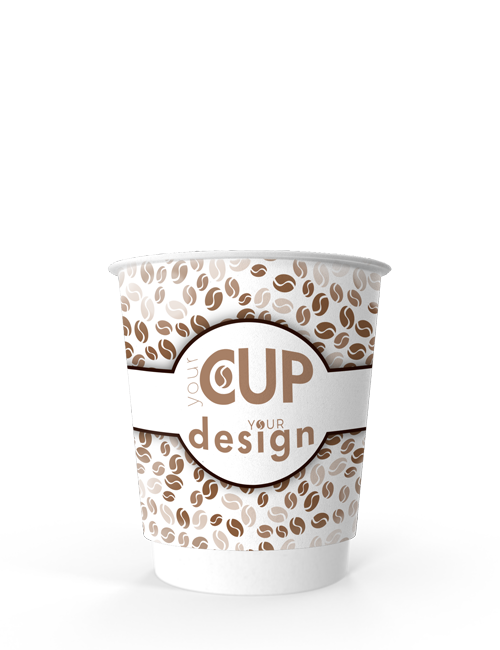 The personalised 8 oz Double Wall Paper Cup is ideal for any hot takeaway beverage. Use it to spread the message of your brand while simultaneously serving your guests or customers to delicious warming drinks! A comfort for a cold day! Our Double Wall Cups have two separate layers of cardboard separated by an isolating air gap. Without the need for sleeves, this design guards against even the hottest beverage! Custom printed with your logo, the CupPrint Double Wall promotional cup will impress customers at any event or conference, in restaurants, businesses, cafes, and shops – the opportunities are endless! The inner wall of the paper cup is a rigid 310 gm top-notch boxboard. The outer wall consists of a near equal unyielding 300 gm high-quality boxboard. Your 8 oz Double Wall Cups can be printed in full colour or process inks – all specialised to be odourless and food safe. Our careful custom printing makes your Double Wall Cup become a bold promotional piece. Go ahead – show it off. We totally approve! For your individual Double Wall Cup 8 oz design we provide you here our rectangular template as PDF for download.